Faith is important in Ethiopia, whether it’s Christianity or Islam. The Ethiopian Orthodox Church claims over 44% of the country’s population, Evangelical Christians another 19% and Islam about 35%. Churches and mosques stand in almost every community and it’s often difficult for visitors to distinguish the call to prayer from early morning Orthodox chanting. Public schools celebrate holidays of both major religions and relations have been generally cordial through recent years. Yet, it is the ancient orthodox practice that has the strongest grip on the northern part of the country where white clad men and women exhibit their faith throughout the countryside. 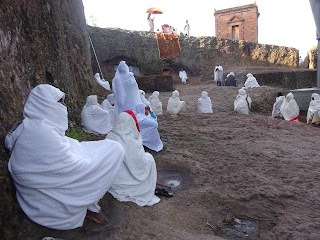 And, nowhere was that more prevalent than in Lalibela, to the north of Addis Ababa, in the heart of the beautiful Amhara Plateau. The traditional story of Lalibela’s creation is almost a fairly tale. A Christian king recognizes his people cannot make the pilgrimage to Jerusalem and decides to bring Christianity’s home place to his people. 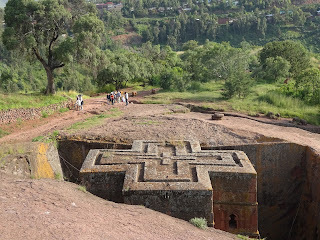 It is believed that in the 12th century, King Lalibela had a God-inspired dream to recreate the Holy Land in Ethiopia. Over the next 23 years eleven rock hewn churches were carved below ground by hammer and chisel and given Jerusalem names. Worshipers could attend churches with holy auras such as House of Mount Sinai or Golgotha. A stream was even renamed the River Jordan. 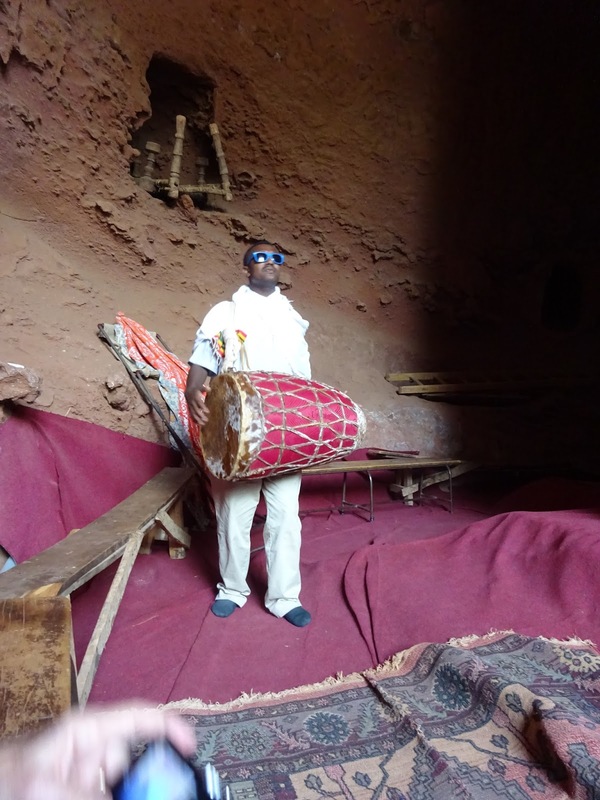 Wearing blue rim sunglasses, enthusiasm and a bright smile, Muchaw Derebe guided us through the wonderland of Lalibela’s stone churches, designated a UNESCO world heritage site in 1978. As the son of an orthodox priest and a deacon himself, Muchaw offered a unique perspective of his native town – one that had grown tenfold from a village of 2,000 to an emerging tourist destination of 20,000. 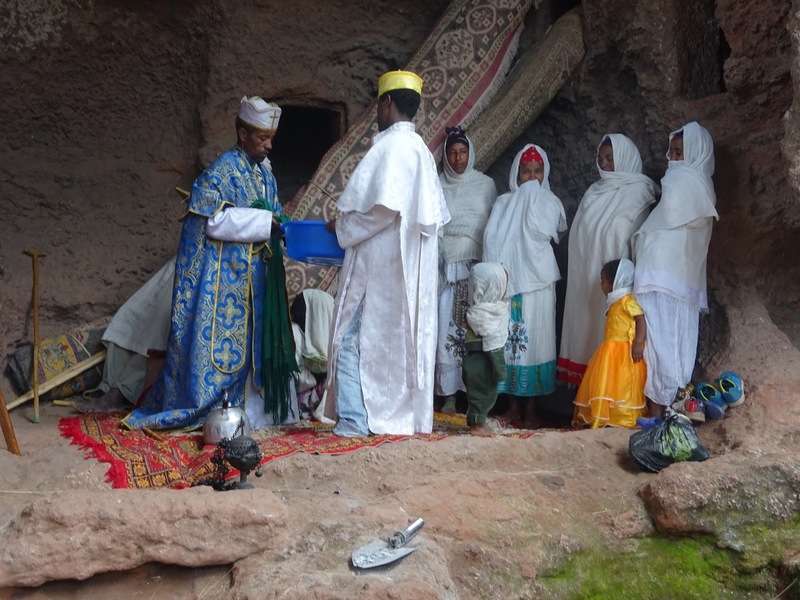 Despite the increase in visitors, churches are still very much in use offering home parishes to residents of Lalibela. 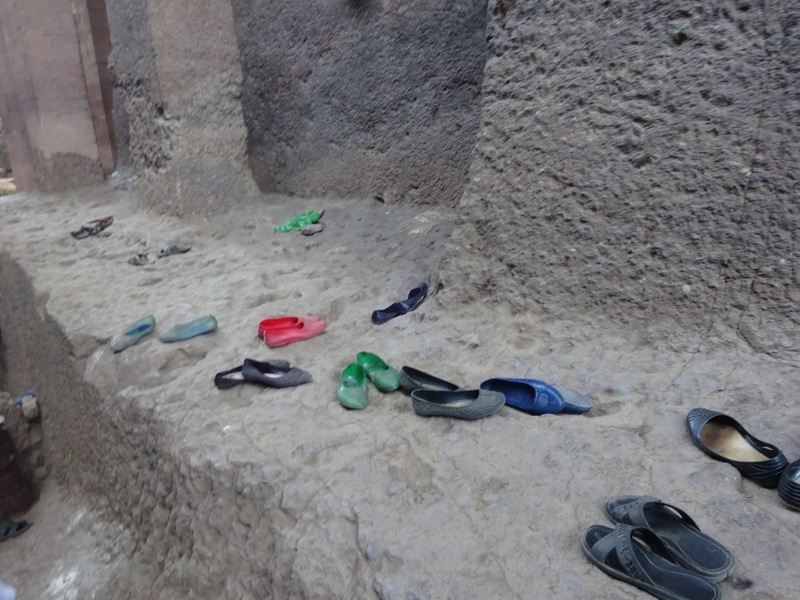 Shoes were removed as we entered each church based on God’s instruction to Moses to take off his shoes when standing on holy ground. Many kiss the outer wall before walking into the initial chanting room where priests pray before services. Orthodox churches contain strong Jewish roots – men and women stand apart and enter from different sides of the church. A curtain covers the communion table which will be drawn back for services. Behind is the Holy of Holies, a site open only to priests and deacons, where the tabot or replica of the Ten Commandments is kept. At all hours a priest is present, available for blessings. 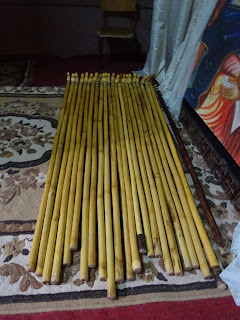 Occasionally, Muchaw would pick up a drum and chant lightly or insist that we try out a prayer stick, used for support during the long three hour services. Some of the churches are still attached to the mountain with the rest free standing. All require a walk down as well as treks through narrow pathways and tunnels that connect houses of worship. One building named Bethlehem provides space for priests and deacons to prepare communion bread, later carried through the labyrinth to different churches. 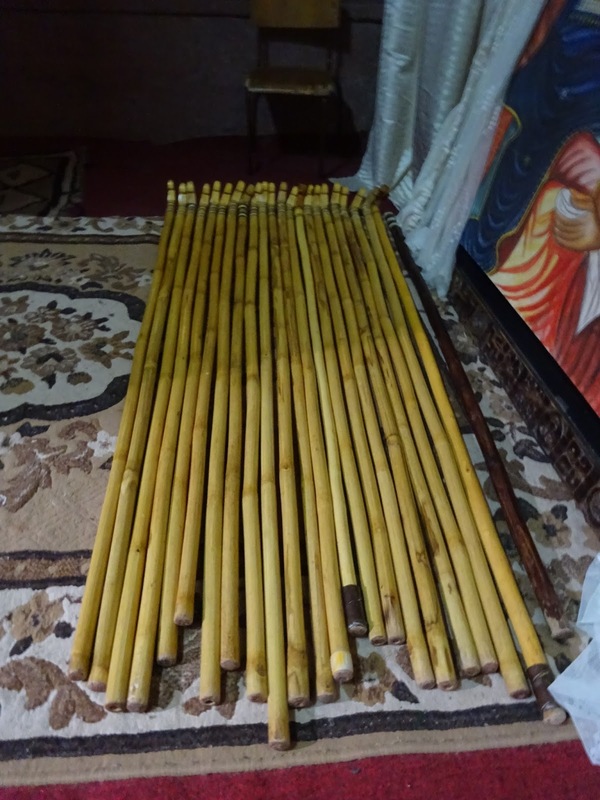 Occasional baptismal pools were available and even a pond filled with papyrus, used with other grasses to welcome visitors in the churches – just as Jesus was welcomed in Jerusalem. It was all highly symbolic and Muchaw could provide the hidden meaning. Our visit coincided with Holy Cross Day – a surprise since we had just celebrated that event on September 14 at Holy Cross Episcopal church in Paris. Since the Ethiopian calendar doesn’t correlate with the Gregorian calendar, we celebrated it again. Muchaw picked us up early and brought us netelas, white cloth worn by women for services. We approached the Holy Cross church where worshipers stood and sat on the ground above the church. 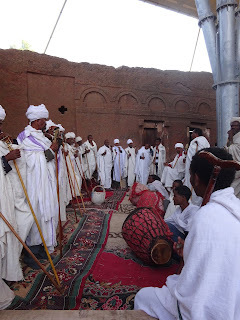 On the opposite rim, a priest read from the Bible in Ge’ez, the ancient Ethiopian language and later explained the reading in Amharic, its current language. 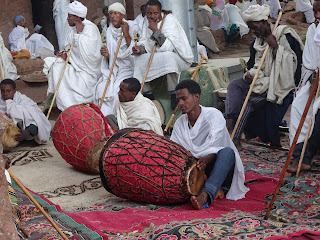 Below, a U-shaped gathering of priests and deacons had been chanting outside since 5 a.m. with aid of slow drums and timbrels, tambourine like instruments. All knew the words by heart and Muchaw couldn’t help but participate in this very biblical setting. We later happened on to a baptism of a baby girl outside a church in the shelter of a cave opening, attended by women of the family. The priest blessed a pitcher of water and poured it onto the naked child in a plastic tub, causing a healthy cry. The women sang their high pitched ululations in joy. After the baby was dried, the priest playfully splashed holy water onto the women and children standing nearby. The family men did not attend and were apparently at home, preparing for the approaching celebration. Throughout our time in the Holy Land of Lalibela, we saw few tourists and many locals. 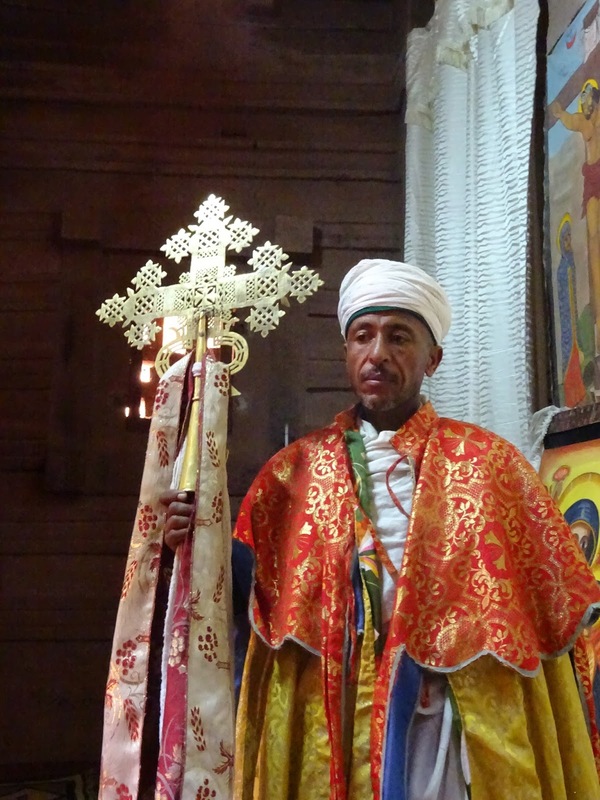 The spiritual life of Orthodox Ethiopia was on full display. But as more hotels are built and roads newly constructed with Chinese help, visitor numbers will increase. We can only hope that it can continue to be a site that is astonishing in its construction, beautiful in location and holy in its use.